Roth presents a pair of Charlies at Bristol | What Hi-Fi? 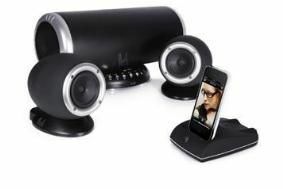 You can choose from a standard stereo system, or the 2.1 version with a subwoofer (shown). Both come with a 'Made for iPhone' RothDock, which enables a wireless connection between your iPod/iPhone and the speakers. Alternatively, they can be hooked up to a PC or laptop via the USB connection (which will also synchronise with your iTunes), or using the 3.5mm input. The Charlie 2.0 system is an active monitor design, with a built-in 15W amplifier. Charlie 2.1 houses the electronics within the subwoofer, delivering 25W to each speaker and an additional 25W to the subwoofer. Available in black or white from April, the systems will cost £199 and £299 respectively. You'll be able to see them at this weekend's Bristol Sound & Vision Show.